State Representative Julie Emerson (R-Carencro) – who is also a leading candidate to replace Roger Villere as LAGOP Chairman next month – released a video on her Facebook page this morning, encouraging millennials to abandon the Democrat Party. Emerson recounts the history of socialism, reminding her viewers what the “Z” in Nazi stands for (it’s not Trump)…and about the untold genocide in Mao’s China. She reminds her audience that Cuba wasn’t turned into a third world country by Microsoft. 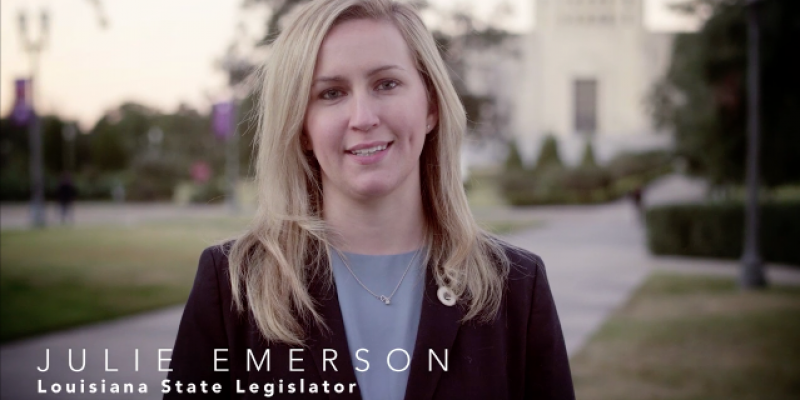 Rep. Emerson is one of the most popular young legislators in Louisiana. She also happens to be the youngest one. Her work across the party aisle last year for criminal justice reform made national headlines. Yet, a true member of the so-called “Party of No”, she still has one of the most conservative voting records in the Louisiana House of Representatives. After 14 years, Roger Villere is retiring as chairman of the Republican Party of Louisiana. Chairman Julie Emerson would certainly be a jolt of lightening into a state party that has had some trouble fundraising over the past couple of years. JBE must be defeated in 2019. With almost 20 seats in the State Senate opening in the same election, the LAGOP must be a dominant force. A conservative State Senate, with John Alario back at home, would likely change Louisiana forever.